Fax Modulation solutions are available for Group 3 Fax optimized for a wide variety of platforms. This includes complete and robust implementations for ITU-T modulations V.34, V.17, V.29, V.27ter, and V.21 channel 2. Contact us to discuss your fax modem application requirements. VOCAL’s fax modulation software is optimized for DSPs and conventional processors from TI, ADI, Intel, ARM and other vendors. Our software is available for licensing as a standalone algorithm or library. Custom solutions are also available for your unique application requirements. As an option, these modulations can be combined with VOCAL’s V.34Fax to provide image transfer rates of up to 33600 bps. 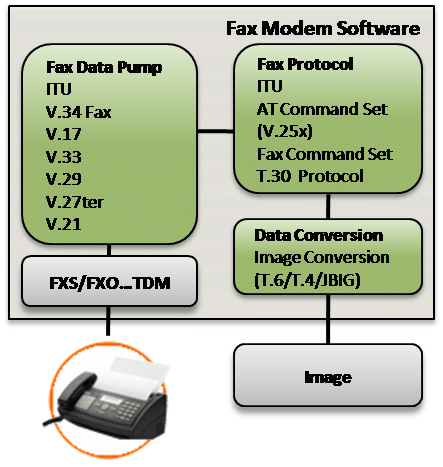 The V.21 channel 2 and V.27ter are the minimum requirements for Group 3 Fax. For non V.34fax, V.21 channel 2 is used to transfer T.30 control frames. The “high speed” modulations V.27ter, V.29 and V.17 are used for the “compressed image” transfer. The term “compressed image” is used loosely here, as the high speed data may in actuality be other data, such as in the case of binary file transfer (BFT). Using the Command Set Controller (CSC) in VOCAL’s T.30 library or with VOCAL’s facsimile service Class 1 Command Set(EIA-578 and T.31) all of the facsimile modulations and data streams can be controlled. The T.30 library could in turn be controlled by VOCAL’s facsimile service Class 2 Command Sets T.32 (Fax Class 2.1), EIA-592 (Fax Class 2.0), or industry standard (Fax Class 2). With Fax Class 1, most of the protocol is executed in software, with the advantage that any changes don’t require hardware modifications. This is in contrast to Fax Class 2, where image processing is handled by the modem. Facsimile service class 2 command sets (T.32, EIA-592 and industry standard fax class 2) available.